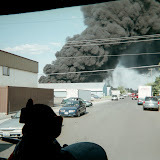 In the evening of August 29, 2007 beginning at 00:54 AM all of the on-duty companies of B-Shift Spokane Firefighters under the direction of Battalion Chiefs Craig Cornelius and Mike Inman responded to four separate, near-simultaneous structure fires. The incidents in chronological order were located at; 1724 West Nora (House/Porch Fire) 00:54 AM, 1902 West Sharp (House Fire) 01:08 AM, 1908 West Dean (House Fire) 01:30 AM and1912 West Gardner (Truck Fire and Multiple Unit Home) 01:44 AM. As you can see, the multiple alarms were in close proximity to each other and the on-duty Battalion Chief's were forced to move resources quickly from incident to incident as the emergencies continued to occur. Several downtown companies actually responded to three of the four incidents and will spend their morning's completing overhaul work and picking up equipment. The Firefighters, Investigators and Chief Officers did an outstanding job of managing the incidents and the demand for resources during this morning's event and their performance cannot be overstated. PROBABLE CAUSE: The cause is under investigation and appears incendiary in nature. We have a reasonable suspicion that a person/person(s) is responsible for setting all of this morning's fires. All of the incidents were easily within walking, or biking range of each other and the method of setting the fires are consistent with exterior sets near the primary exits of these homes. This is a very dangerous situation for residents and highlights the importance of knowing two ways out of any structure. DAMAGE EXTENT: The damage is varied per address. Individual value estimates may be available later in the week. NARRATIVE: On 8/26/07 at 6:18 P.M. the Spokane Fire Department responded 2 engine companies, 2 ladder companies, a pumper ladder company, a rescue unit and 2 battalion chiefs to a fire inside a dwelling located at 4814 N. Magnolia. Fire crews found smoke coming from the main floor and a number of windows upon arrival. An immediate offensive attack was conducted inside the structure and it was discovered that the fire was involving the entire kitchen and was rapidly extending towards other areas of the home. Two adults and two children were at home at the time of the blaze and all made their way out of the dwelling to safety. The fire was effectively contained after approximately 10 minutes. Overhaul was begun after a thorough search of the interior was accomplished. This activity involved fire crews shoveling out burned debris, inspecting areas with their thermal camera, and extinguishment of hot spots in order to declare the fire totally out. Fire crews remained at the house for 2 hours completing these tasks. This fire was fought by 20 firefighters. The cause of this fire was cooking grease that overheated on the stove. The grease suddenly ignited and then spread rapidly to the wooden cabinets above. Once the wood caught fire, the fire grew hotter and spread throughout the kitchen area. The home sustained significant smoke and heat damage. The Spokane Fire Department would like to remind homeowners that keeping a fire extinguisher inside the home is a good idea. Know where it is kept, and make sure it is easily accessible. The kitchen area is a good place to keep an extinguisher as cooking fires are one of the most common types of fires inside dwellings. PROBABLE CAUSE: This fire was caused by grease used for frying that overheated inside of a pan and then ignited, spreading to wooden cabinets above the stove in the kitchen. DAMAGE EXTENT: Major heat damage to the entire kitchen. Moderate to major smoke damage throughout the dwelling. The contents inside the home that were affected by the fire consisted of clothing, furniture, belongings and keepsakes.